If anyone has an ear to the ground in DC it’s Dan Silverman. In fact, the guy has both ears to the ground... even though it's anatomically impossible. You know him as the Prince of Petworth, and we solicited him to identify the secret-est spots in town. How does one man make so many discoveries? Easy — he walks everywhere. 15-20 miles a day sometimes. We got him to hold still long enough to help us find these 13 hidden gems. 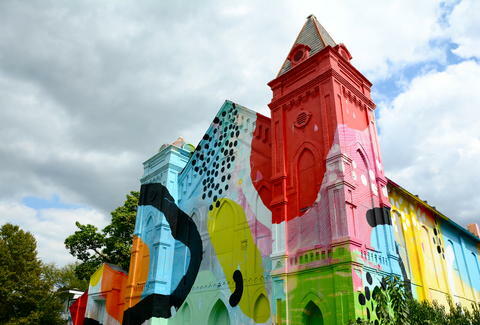 Murals on a wall are cool and all, but what about an entire church? At 700 Delaware Ave SW you’ll find a previously white, unassuming church that has been transformed by Atlanta-based artist Alex “Hense” Brewer into something way way cooler. We imagine that if this church were still a place of worship, they’d switch out hymns for Grateful Dead riffs. The purpose of the project was to aid in the transformation of the SW neighborhood into a true arts district. Not only is there a full-size log cabin located smack dab in the center of the Mansion on O Street, but you can also stay there! 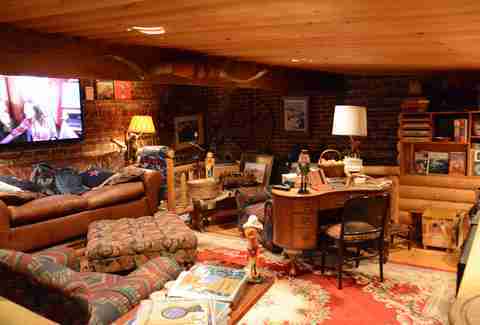 The two-level cabin includes a timber bed, a plasma TV downstairs (this is an Aspen cabin, not an Abe Lincoln cabin), a big screen TV upstairs, a full kitchen, and an aquarium. But the bathroom is where it’s at: there’s a Jacuzzi tub that has the ability to morph into a sauna. The whole thing is yours for $1250 a night. Did we mention it’s INSIDE a mansion? Don’t take our word for it, book a tour of the quirky museum spanning three rowhouses. 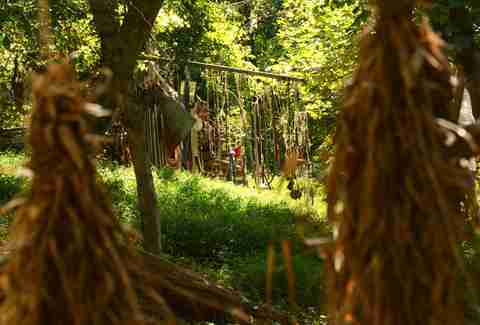 Relive the True Detective finale, because we found Carcosa right here in DC. The Glass Forest, ornamented with old bicycle parts, decorative mirrors, twig tangles, and more is simultaneously creepy and cool. Find it by parking at Palisades Park and walking toward what looks like someone’s backyard. The trail into the woods is on the right, and it only takes a moment before your eye catches something shiny. Unfortunately, the forest was vandalized recently, but it’s back and better than ever. You can’t swim laps in Lover's Lane Pool, despite the fact that it has "lane" in its name. And don’t even ask about "lovers". 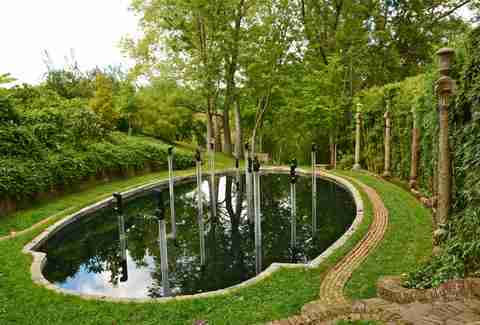 But, what IS rad about this pond inside the Dumbarton Oaks Gardens is that it makes music. The hoity-toity name for what’s going on is a "soundscape", but lets break it down. Music produced by bamboo percussion instruments emanates from snorkel-like speakers, which bounces off amphitheater seating, creating an ethereal, secret-garden experience. When someone says "museum" in DC, you usually balk at the word and avoid the National Mall, right? Well, what if there was a museum dedicated to drugs, drug abuse, and drug law enforcement tucked away across the river? 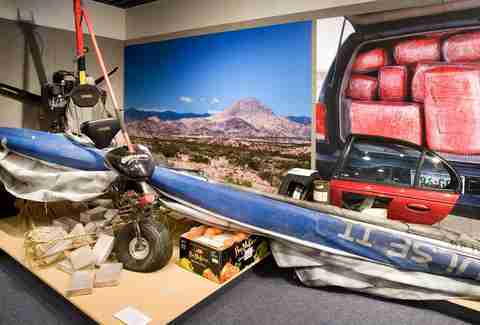 The Drug Enforcement Agency Museum recently renovated and updated EVERYTHING. Learn about opium dens, patent medicines that contained something illegal, the history of heroin and jazz, Pablo Escobar and the Colombian cartels, post 9-11 narco-terrorism, '70s DC head shops, and more. Also, check out actual bundles of pot that fell from the sky over San Diego from a plane traveling from Mexico (pictured). The museum is open Tues-Fri from 10am-4pm. 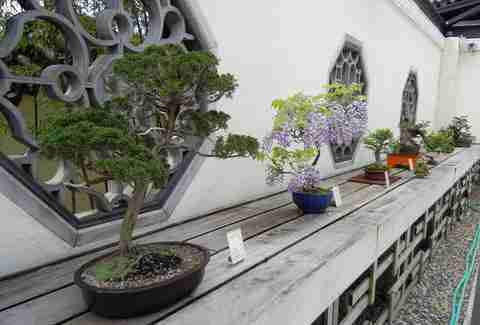 Tucked away in the National Arboretum is the National Bonsai & Penjing Museum. Come ready to appreciate the age and the styling of each tiny tree — there are 63 of them. and it goes without saying that they’re SUPER old. There’s more: on select dates, the museum offers "CSI Bonsai"— an opportunity for crime scene detectives to determine how you killed your tree and to tell you how to do better next time. You can see the collection from April through October, and "CSI Bonsai" ends October 13. 7. 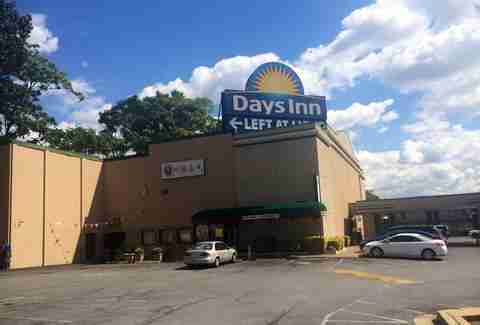 Some of the city's best Chinese food is in a... Days Inn? Ready for this? Housed inside a Days Inn off of New York Ave is some of the best Chinese food in DC. Homestyle and authentic (yeah, yeah, we know this word is contentious) are just a couple descriptors about this spot that serves Szechuan and other types of Chinese cuisine. Drop in on your way to check out #6 or #10 on this list, and don’t miss the Dan Dan noodles, shredded beef with hot chili, or cumin lamb. Bilbo Baggins in the house! Well, he’s not really IN this house, but it sure looks that way. 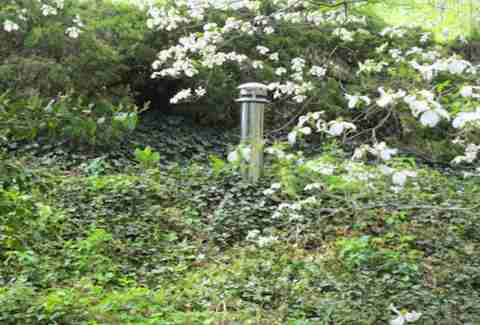 Check out this grassy knoll of a dwelling, with merely a chimney announcing its presence to the outside world (at least from one vantage point). It’s architecturally possible because it’s built into the side of a hill. We don’t want to spoil the fun with an address, because part of the fun of this secret place is finding it. Head to the Forest Hills neighborhood and look for hobbits. 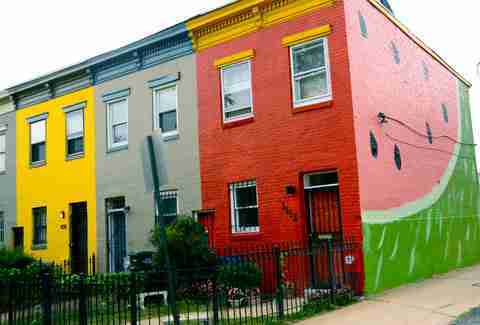 Back in ’08, The Post nabbed this Q Street house some attention by interviewing its tenants about their peculiar paint job. Apparently red was the goal, but a putrid pink evoking Pepto-Bismol was the result. Like a tattoo gone wrong, they made the best out of a bad situation and painted a giant watermelon (less permanent, but still...). You can’t help but smile when you see this thing, especially if you’re under the age of eight. Once you enter the gate, you’ll be dumbfounded that you were just in a neighborhood in NE DC. 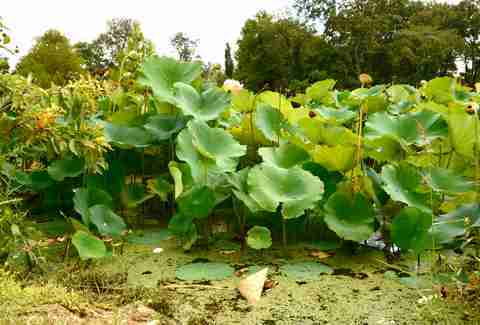 The aquatic gardens are a series of ponds punctuated with lily pads, lotus flowers, and lilies. While some of the best viewing is in the spring and summer, the park is open year-round. If you’re afraid of snakes, we suggest you stay home and look at the desktop backgrounds that came with your computer instead— chances are there’s one that looks like this. Don't have a car? The Deanwood Metro stop is close enough to get you there. We asked three dudes on the street how to find this so-called "secret park", so you don’t have to. Head to the intersection of 1st and V St, NW and walk towards N Capitol St, then turn right into the first alley. 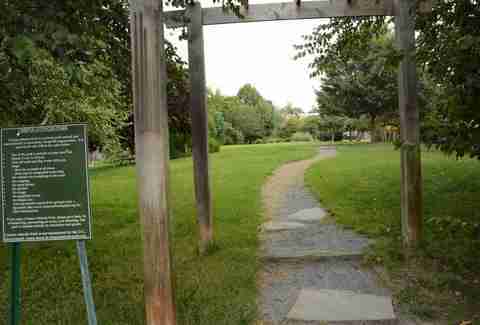 Steps later, a Crispus Attucks park will pop up, tucked behind rowhouses. The urban oasis is named after a former slave who was the first person to lose his life in the Boston Massacre at the start of the American Revolution. Pack a picnic and hide for a bit. You’ll want to cry and confess to things you didn’t do upon coming face-to-face with the shrouded Adams Memorial. It’s THAT intense. The story: writer Henry Adams’ wife, Clover, committed suicide in 1885 by drinking photography chemicals. He then commissioned Augustus Saint-Gaudens to cast a memorial representing the Buddhist idea of nirvana where there is no joy or sorrow. If there is such thing as funerary art, this is it at its finest. 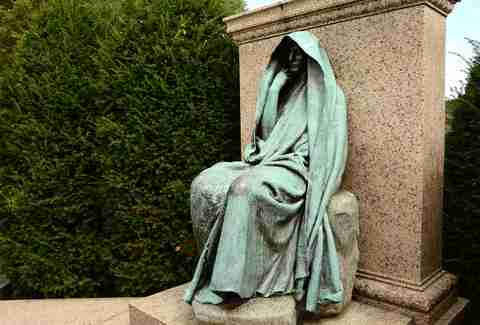 Find it in Section E of Rock Creek Cemetery — which is worth exploring in its own right. 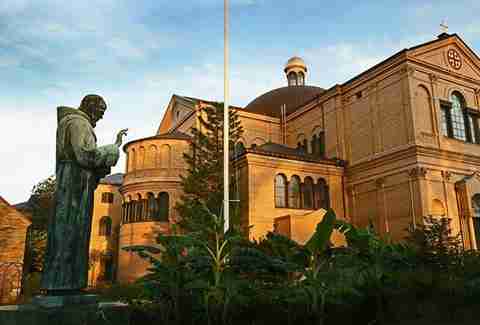 Before we get into the fact that you can get your furry friend blessed here, let’s start with the incredible fact that there’s a HUGE Franciscan Monastery in Brookland! It looks like something you saw in your few minutes of sobriety during your study abroad experience in Europe. It’s breathtaking. Okay, back to pets. Once a year, friars bless pets in conjunction with the feast day of Saint Francis of Assisi, the patron saint of animals (Saturday, Oct 4th this year... better luck next year if you missed it!). Find the monastery at 1400 Quincy St, NE.